It is no wonder some schools are turning to the services of expensive marketing consultancies like MTM Consulting when they are trying to "sell" a disadvantage as if it was an advantage. 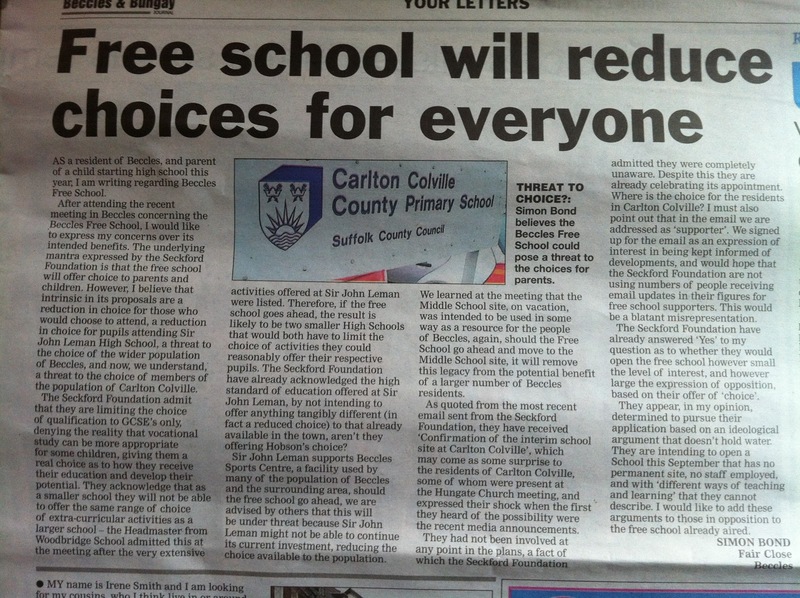 The Seckford Suffolk chain free schools (Beccles, Saxmundaham, Stoke-by-Nayland and Ixworth) are all proposing to offer what looks like a very narrow curriculum. What is the advantage of the Free School over other state schools in the area? ....The curriculum will concentrate on subjects that we believe are crucial for the next stage of education. We will give more time than usual to maths and English, and there will be the opportunity to study science, French, and Spanish alongside other subjects. There will be no vocational qualifications available. Yes that's right not offering vocational qualifications is being pitched as an advantage. I cannot really understand this after all nobody is suggesting that children would have to take these qualifications so why would not offering them be advantageous? But does the school really meet that criteria? There is nothing that the Seckford Free Schools curriculum offers that is not available at all of the other local secondary schools and they all offer more choice in addition. So you can combine your studies of EBacc subjects with say a GCSE in PE if you are sporting or Photography if that is an interest. You would do this as well not instead of the core academic curriculum. Or if you preferred more practical education you could perhaps do a BTEC in Engineering or Food Technology with your Maths and English. I have shown this in a table below taking as an example (as it isn't one of the direct competitors to the free schools) the high performing Hartismere School in Eye. You can see in bold the additional subjects it offers up to 16, it does many more in its sixth form too. A few other things struck me in this comparison. 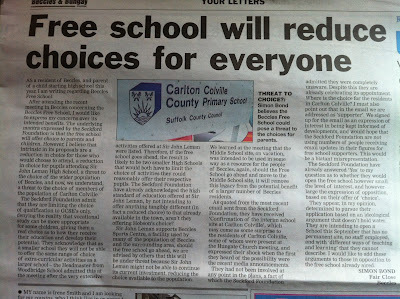 Seckford will offer ICT but it will be optional and they won't be offering a GCSE in Computing or Computer Science. This seems really poor for a new 21st century school. On the other extreme Hartismere even offers an iGCSE in Latin! So Hartismere a successful school judged Outstanding by Ofsted and Suffolk's first Academy managed to combine an academic tradition as a former Grammar school with a stated mission to provide for the needs of all local children. This school clearly shows a school can do both successfully. Especially in rural Suffolk. The Seckford Foundation admit that they are limiting the choice of qualifications to GCSEs only, denying then reality that vocational study can be more appropriate for some children, giving them a real choice as to how they receive their education and develop their potential. They acknowledge that as a smaller school they will not be able to offer the same choice of extra-curricular activities as a larger school. Indeed in a public meeting the Head of Woodbridge, Stephen Cole told parents "that the proposed school would be “unashamedly academic”, with Year 7s focusing on maths and English for half of their curriculum"
I suspect it will be fiddled-selective....Looking at the website, it looks like [Tony Callaghan] wants to recreate his prep school. No vocational stuff at all, that'll help keep the lower ability away, if they aren't put off by the 1970s curriculum. Indeed MTM consultancy state that they expect a free school to have a similar effect on a local private schools as a selective grammar school. Why would that be unless these schools were essentially selective?